SUVs account for 16 per cent of the industry share in MEA. DUBAI, U.A.E. : Ford has a long history of SUV leadership, with all-time favourite nameplates such as Escape, Edge, Explorer and Expedition setting the benchmarks for their segments since their debut. Having sold more than 1.5 million SUVs globally last year and plans to introduce four all-new SUV’s in the next five years, Ford is sure to reinforce that leadership. Ford helped create the SUV segment with the Explorer more than 25 years ago. Since then it has sold more than eight million globally, or one every two minutes. In the next five years, Ford’s SUV lineup will be completely new or refreshed, delivering smart technologies, enhanced safety features, and superior comfort and capability that empower Ford SUV owners to go anywhere, anytime. Recent Ford research has shown that once millennials – an age group entering their prime child-rearing years – begin thinking about starting a family, their interest in shopping for SUVs is piqued significantly. From the legendary full-size Expedition to the mid-size Explorer and Everest SUVs; the seven-passenger utility Flex, to the small, chic Escape SUV, and the compact urban EcoSport CUV, Ford is showing the strength of its global utility portfolio. This packed stable – lead by refined, boldly-styled new flagship CUV, the Ford Edge – gives not only millennials, but also baby boomers, a full range of exceptional utility vehicles to choose from. When launched a decade ago, Edge helped define the crossover sport utility vehicle segment. With a car-based design, Edge delivered better on-road comfort, fuel efficiency and overall driving dynamics than any truck-based SUV. It was proof a utility vehicle could meet the demanding needs of an everyday commuter, and it soon became its segment leader in the Middle East. The all-new Ford Edge has been remade in almost every single detail, always keeping in mind the customer, who expects something premium, powerful and special. With a structure more rigid than ever and a suspension tuned to the highest global standards, the Edge is a high-tech utility that delivers a special driving experience customers will feel from their first moments behind the wheel, and is primed to reset the standard in the two-row utility vehicle market. Joining Edge is Ford’s signature full-size SUV, Explorer, a centrepiece of Ford’s global utility vehicle lineup because it delivers an ideal combination of form and function. Introduced in 1990 as a 1991 model, Explorer featured generous interior space customers were looking for, and was engineered specifically for people seeking adventure for their families and a way to express their individuality. And that’s still true today, with its popularity unwavering as America’s best-selling three-row SUV. 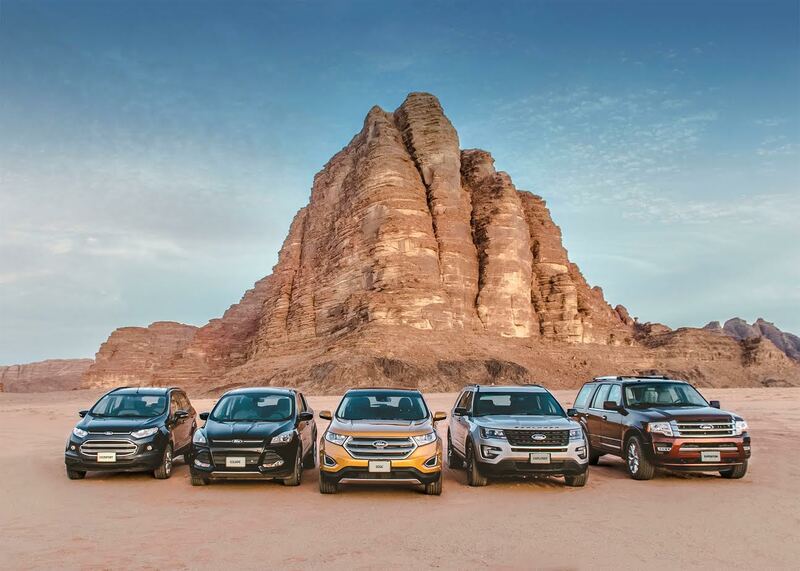 Ford’s biggest SUV, the Ford Expedition, enjoys an existence as a serious contender in the Middle East’s full-size SUV segment and one of the most capable and safest SUV in its category. The latest model is the most powerful, fuel-efficient Expedition to date, with a 3.5-litre EcoBoost V6 engine delivering 370PS and best-in-class torque. Customers appreciate the space, performance, comfort and capability the Expedition delivers for up to eight passengers. Escape is the second best-selling vehicle in the Ford lineup globally, only behind the Ford F-150. Ford Escape’s popularity is born of its reputation for great fuel economy, versatility and technology aimed at helping customers – all in a sleek design. This is a competitive segment, and Escape offers features and amenities that make it irresistible to customers. Escape’s signature technology is its available hands-free liftgate that allows fast and easy access to the cargo area with a gentle kicking motion. Along with versatility, great fuel economy is another reason Escape is popular with customers. Ford Flex is a seven-passenger utility vehicle that offers power, efficiency, technology and driver-assist features in one stylish package. It comes standard with a 3.5-litre V6 engine featuring twin independent variable camshaft timing to control when the valves open and close for improved performance. This advanced V6 delivers 291 PS and 344 Nm of torque, and is mated to an equally advanced six-speed SelectShift automatic transmission. Also available on Flex is the 3.5-litre twin-turbocharged EcoBoost V6 engine producing 370 PS and 475 NM of torque from 1,500 rpm to 5,250 rpm. Available in South Africa, the all-new Ford Everest is a rugged seven-seat SUV featuring body-on-frame construction, intelligent four-wheel drive and an Advanced Terrain Management System to help navigate challenging terrain with ease. Powered by Ford’s South-African produced 3.2-litre five-cylinder Duratorq TDCi engine, Everest, with automatic transmission, comes in two specification levels – XLT and the range-topping Limited. Ford recently added a 2.2-litre Duratorq TDCi four-cylinder diesel engine to the range, along with a wider spread of specification levels. Since its launch last year, the all-new Everest has been extremely well received, with demand far outstripping supply, prompting production of the capable utility vehicle to extend to Ford’s Silverton Assembly Plant in South Africa. Rounding out Ford’s current SUV lineup is the compact EcoSport, featuring bold lines, contemporary shape and a sophisticated interior, all reflecting its credentials as a capable, flexible and practical urban SUV. The EcoSport provides roomy space for five, a high driving position with outstanding visibility, a refined cabin environment engineered for quiet operation, carefully selected and matched materials, and a modern design ethos. It all adds up to make the Ford EcoSport a compelling alternative to the run-of-the-mill compact car, and ideal those just starting families.